Now you're ready to use the GD module to produce a simple game. 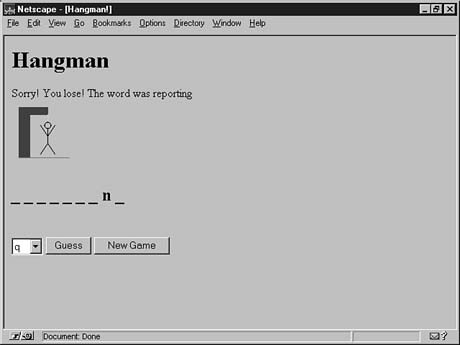 Hangman is a game that involves some dynamically drawn graphics. This example contains some solid filled shapes, outline shapes, lines, and transparency. To create this game, you combine what you've learned so far about CGI programming with this new concept of dynamic image creation. As you can see from the main program, you have two main subroutines. The first, which follows, is called gameIntro(); it is used to initialize the game. Initialization involves choosing a random word, drawing the empty gallows, and setting up some variables used to keep track of the user's progress. You use the srand() Perl function to set the seed for generating random numbers. Using the current time together with the process ID should give you a random value. This subroutine calls three other subroutines, which are shared with the next subroutine. The other main subroutine, which follows, is called playGame(); here you query the letter that the user guesses and fill in the found letters on each subsequent call. This routine is also responsible for determining when the user wins or loses. It also makes use of the drawHangman(), drawWord(), and gameForm() subroutines. Finally, you need the guessedFullWord() function, which returns whether the user has completely guessed the entire word. It uses the same algorithm that drawWord uses, except that it returns FALSE as soon as it detects a letter that has not been found. Images of the game in action are shown in Figures 12.1 through 12.3. Figure 12.1. The Hangman game within the Netscape browser. Figure 12.2. The game after two wrong guesses. Figure 12.3. The game after the user lost. The Hangman game is a simple example of how to use the GD module to draw graphics dynamically from a CGI script. This example runs on UNIX, although you could run it on Windows using a slightly modified version of GD.pm from David Roth. This version is available at ftp://roth.net.com/pub/ntPerl/win32GD.zip. The current version of MacPerl (5.10r2) also supports the standard GD module.